Bakersfield Observed: Los Angeles Magazine takes on Tejon Ranch Co.: hit piece or valentine to environmentalists? 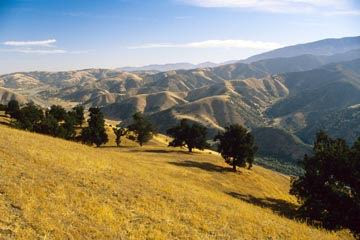 Los Angeles Magazine takes on Tejon Ranch Co.: hit piece or valentine to environmentalists? "Even though the owners are offering to conserve much of their surrounding land, this development remains exactly the sort of breathtaking sprawl, destruction of nature and epic commuting lifestyle that must stop if we intend to get serious about global warming. Tejon Ranch, then, is really a battle over whether America wants to begin acting like a climate hawk or continue to act the climate ostrich. It's the biggest project of its kind, so it's fair to say this is where our future lies � one way or another. Labels: Bob Stine, Center for Biological Diversity, Ed Humes, Tejon Ranch Co. 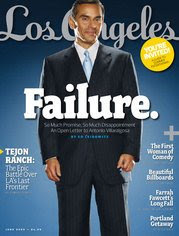 I actually found the Los Angeles Magazine story to be incredibly balanced and truthful. To be honest, it's a story that should have been written in The Bakersfield Californian a long time ago. Oh, that's right, Tejon's CEO is on your board, so you can't write it and you have to attack an incredibly well-written story because of it. If you read the story, this development of 10 percent of Tejon Ranch is not so much supported by the conglomerate of environmental groups, but they are putting up with it in order to save the remaining 90 percent of the ranch and keep it from eventually becoming like the sad 10 percent that is going to be developed. The alternative would have been decades of legislation, as the story states very early on. Let's be honest here. The development is ridiculous. In a time in which most of the world is looking to lessen their impact on the environment, these arrogant idiots are doing whatever they can to heighten their impact. Where are these people going to work? Either in Los Angeles of Bakersfield, each an hour away. That's a lot of vehicle emissions that are absolutely unnecessary. And that's just the beginning. So settle down, sir. The world isn't out to attack your friends and buddies. But you would be a lot more credible (as would your newspaper), if you look at things with your eyes a bit more open. What you will find after opening your eyes is that there is a lot more to the world than this little hick town, and a lot of people are trying to clean up the environment, not ruin it like this smog infested, big truck driving city of Bakersfield. Thanks for your comments but you are off base on alleging we have not covered the Tejon development or written about it. This blog represents my personal thoughts - not the paper's - and speaks for itself. And thanks for the advice to "settle down." I get that from my wife as well. I actually never said that the newspaper hadn't covered the story. I suggested that you should look at this "with your eyes a bit more open." That's all.